JLo plays Zoe, a single woman who has chosen to get pregnant by a sperm donor. She wants to have a baby and she hasn’t found Mr Right to do it with – there seems to be a few of these films on the market right now. Don’t tell me rom coms are somehow a reflection of society? Anyway, she gets pregnant and then she meets the guy. So the rest of the film is about their relationship. This isn’t a great movie by any means, but it’s not totally crap either. It doesn’t have any quirky side kick actors to provide all the funny bits so it’s really not the “laugh out loud” movie as the DVD case says. But it’s a narrative, and if you like a narrative, then you can make it through. Charlie (J-Lo) meets Kevin and they move in together after falling in love. He has a scary mother, Viola Fields, a successful, ex-talk show host with a temper and issues about her little boy (this is played by Jane Fonda). Kevin is a doctor. Charlie is a dog walker/caterer/temp/artist – clearly not good enough for her Kevin. When Kevin asks Charlie to marry him (in front of his mother, weird), so begins Viola’s descent into madness! She sets out to sabotage the relationship, and is doing a great job at it until Charlie decides to hit back. Will there be a wedding and can their relationship stand up to the monster mother-in-law? 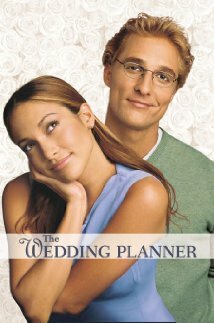 Lopez has appeared in quite a lot of rom coms around 2005. She seems to always play the working class Latino. I’ve grown to really like her as a rom com protagonist and find it interesting the way that class is played out with her characters. Often also, there are references to her weight, as if somehow Jennifer Lopez is playing women who are fat. She has a great body size and it’s good to see that she never did size down the more fame she got. This film is okay. It is fairly typical of rom coms around this time – the idea of love being challenged by something, or the wedding being jeopardised. It would be an enjoyable watch when it comes on TV for those that haven’t seen it. Marisa is a Latino maid in a very upmarket New York hotel. She is an aspiring manager, working hard, and raising her young son alone. She meets a well-known politician, and he mistakes her for a guest instead of a maid. Her mistake was that she lived the fantasy instead of telling the truth. They fall in love, but Marisaa is doubtful that Chris will still love her when he finds out that she’s not a wealthy socialite after all. As this is an early 21st Century rom com, it’s very ‘old school’ with an overheady sense of romance, only one male and female lead, and gentle comedy. It deals, as much as it can, with class issues. But unlike earlier ‘the prince will save me from my world and take me to his world’ type rom coms (you know which one I mean! ), this film lets its female protagonist keep her own identity. He doesn’t save her, and she doesn’t need some-one to save her. Not a bad start to the Century, Maid in Manhattan is a light romantic comedy that scores no real highs nor lows.